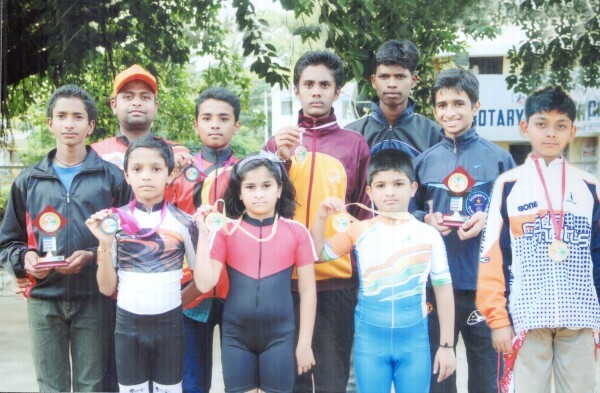 Belgaum Roller Skating Academy has won 6 medals at Inter District Roller Skating Championships 2014 held at Bellary on 12th August 2014. Nearly 180 participants from Davangeri, Kaiga, Hassan, Shimoga, Bangalore, Bellary and Belgaum have taken part in the said championship. The Championship is organized by Bala Bodhini School and Bellary District Roller Skating Association, Bellary. Ther organizers have honored with beautiful memento to 3 time Guinness World Record Holder Master Rohan Kokane and National Medalist Master Bharat Patil for their demonstration during competition. The above skaters are the members of Belgaum Roller Skating Academy and taking training under watchful guidance of Suryakant Hindalgekar, Shashidhar Pol, Vishal Vesane, Kiran Ingawale, Prashant Kamble, and Kunal Raikar. All skaters are practicing at Rotary Corporation Sports Academy’s Skating Rink Goaves, and KLE Society’s Skating Rink, Belgaum. The winners have encouraged by the members of Academy Shri Umesh Kalghatgi, Shir Santosh Sarode, Shir Sudhir Kusane, Prasad Tendolkar and Shri Anand Patil. You can see more number or skating grounds in belgaum, why not make some skaiting grounds in open places of govt rather then making religious placess.